To be perfectly honest, I’ve never cared that much about continuity with the rest of the franchise. Canon gets violated in Star Trek more frequently than the Prime Directive, very often with the same series violating canon that the series itself established several episodes earlier (see: beaming through shields). However, several recent instalments in the franchise haven’t just ignored broader franchise continuity – they’ve ignored their own continuity from just a few scenes or even just a few moments before. To explore this phenomenon, I’d like to introduce “The Shelby Method” of continuity. If you’ve seen ‘Memento’, you’ll be familiar with its main character Leonard Shelby, played by Guy Pearce. In it, Shelby is unable to form new memories – events occur, and within a few minutes he will have forgotten them entirely, finding himself in new and strange situations with no clue as to how he got there. It’s notable for being a great little movie, with a wonderful cast, and for being Hollywood darling Christopher Nolan’s first widely-distributed film and the beginning of his $2.4 billion filmography (but sure, feel free to keep complaining about the plot holes in ‘The Dark Knight Rises’). It’s also notable for inspiring what I have now coined as “The Shelby Method” of film and TV storytelling, most notably used in ‘Star Trek: Into Darkness’ and ‘Star Trek: Discovery’. The significance of any information, plot development or dialogue is retained across the next two camera shots, after which it can be abandoned completely in favour of superseding information. In short, if you’re telling a story for film or TV and you need cool stuff to happen, there is absolutely no need for previous events in the story to stop the cool stuff from happening. Now, as your brain works through that sequence of events, and you begin to think “Hang on, why is Spock shouting ‘KHAAAAAN!’ when it was Admiral Marcus who was more responsible for Kirk’s death?” Spock is already down on Earth, chasing Khan through the streets of San Francisco, and now McCoy is resurrecting a Tribble with Khan’s blood, and now Spock’s on a hovering garbage scow, and now McCoy’s shouting at Uhura, and now Spock’s whaling on Khan with a lump of metal, and now he’s screaming like an animal, and by now you’ve already forgotten about that bit with the warp core, haven’t you? If clever tricks of perspective and carefully-orchestrated special effects are considered “Movie Magic”, then the Shelby Method is “Movie Con-Artistry” – it’s the practice of moving the story along so quickly and dazzling or otherwise overwhelming the audience such that you prevent them from committing the events of your story to their long-term memory. You turn your audience into Leonard Shelby, remembering only the last few brief seconds of what they’ve just experienced. 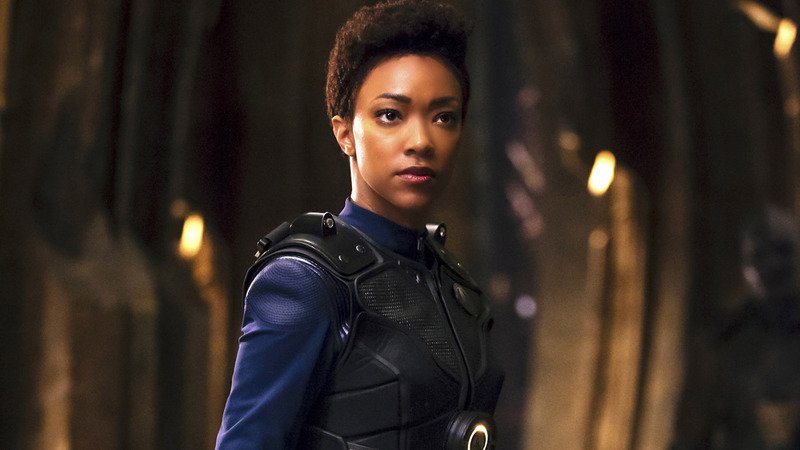 Another example would be in Season 1 of ‘Star Trek: Discovery’, episode 8, ‘Si Vis Pacem, Para Bellum’, where Discovery‘s First Officer, Saru, betrays Burnham and Tyler and attacks them, sabotaging their mission to gain a war-winning advantage against the Klingons. Well, of course not. Because as per the Shelby Method, Saru did nothing mutinous within the last two camera shots, so what possible reason could there be for him to be in the brig? Congratulations, you’ve just been Shelby’d. and then Linus sneezes on the arrogant science officer. Okay, that’s a lot to take in. And maybe it all makes sense as you read it from top to bottom. So, here’s a question: what is the current state of the Enterprise? Are her systems completely down to the extent that they need Morse Code to communicate? She flew up to Discovery under her own power, but then her systems are completely dead except life support. All of her lights and engines are on as she approaches Discovery, at a time when she can’t even send an audio message, or even her registry number, but then they’re off less than two minutes later. I guess Time Lords are canon in Trek now. Yes, that is a manned service pod flying around inside the hull of Discovery. Well, now it seems like Pike had some extensive communications with Starfleet after the Enterprise‘s systems went completely down. Enough to transmit her status, to get a response, to request that Starfleet not contact Discovery themselves so that he can pass the message along, and gets a response about the status of the towing team, and then sends a garbled distress signal unable to even identify his own ship via its registry number. 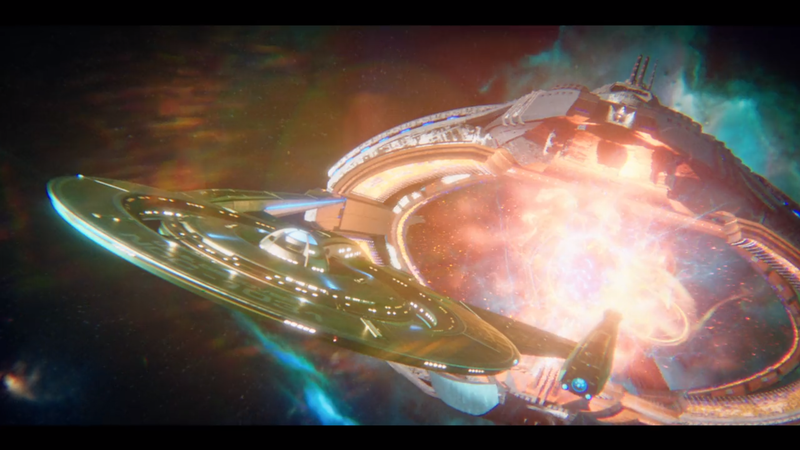 Which all happened before the Enterprise lost all power to all her systems, because we see her travelling towards Discovery after the show establishes that her communications are completely down. Which means, whilst Discovery was at Earth, and all the crew were getting their medals, and Burnham was chatting with Sarek about that one time he tried to wipe out an entire civilisation, the blue uniforms with metallic division colours were the standard uniform. Then they beam up to the ship, head into warp, and somehow nobody told Starfleet’s most advanced starship about the Red Bursts, or about the change in uniform. 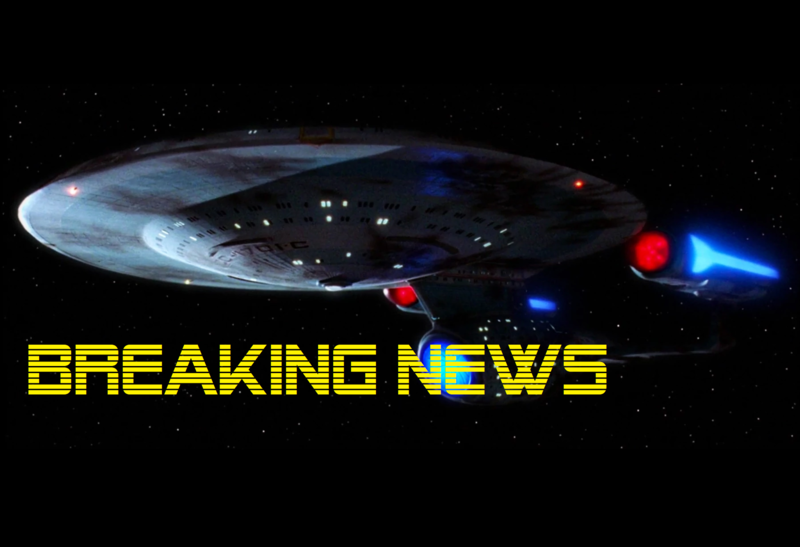 Meanwhile, we find out later that Enterprise sat out the war (as Starfleet’s “instrument of last resort”???? Despite the Klingon ships being in orbit over Earth????) on its five-year mission, presumably returning to Earth at some point before being dispatched to investigate the Red Bursts. 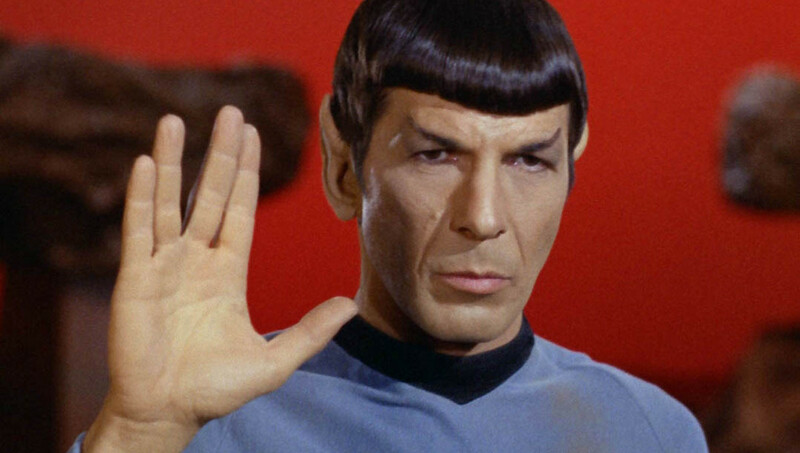 Which would be a minimum of six hours before Discovery leaves Earth for Vulcan. How does Enterprise have the new uniforms before Discovery? How does Enterprise know about the Red Bursts before Discovery? If you can’t figure it out, then congratulations. My previous examples took place over longer periods of time: several scenes and about twenty minutes of screen time in ‘Into Darkness’, and roughly five minutes and a handful of scenes in ‘Discovery’. Now I want to take a look at a single-scene example, with the relevant events taking place within 66 seconds of each other. 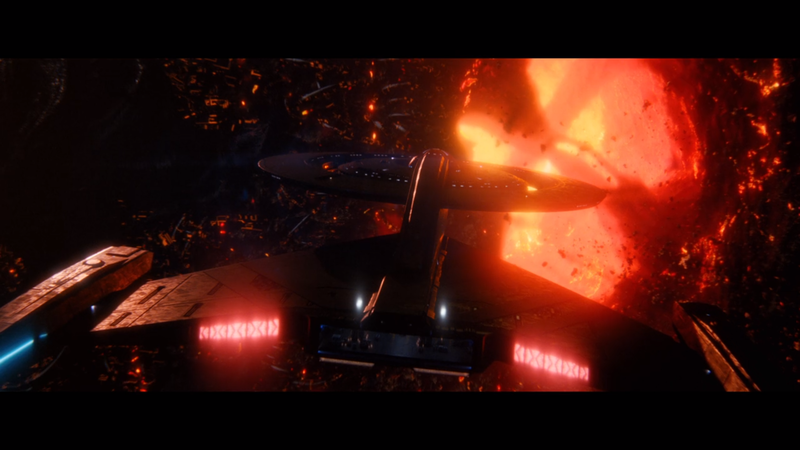 So, under the command of Captain Pike, Discovery approaches a massive interstellar asteroid. so Saru’s pupil dilates and he reads the registry number. 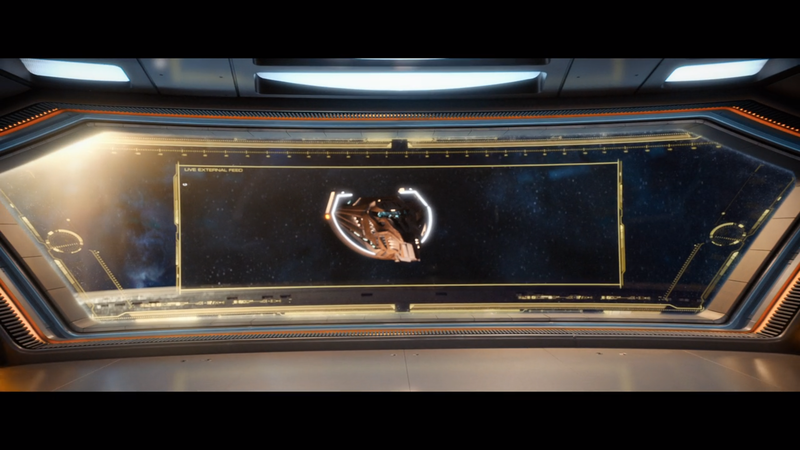 So, does Saru’s vision allow him to… add pixels to the digital screen overlay? If not, then couldn’t anyone read the display better by just walking closer towards it? If it’s not a digital display, then why does it appear like a window popping up on a Macbook? And in any case, are Saru’s eyes really better than high-tech cameras with telescopic lenses? If you want to track this yourself, then go to time code 27:44 and start watching. Within one minute and six seconds, you’ll be at Saru’s pupil dilation. Which means that within one minute and six seconds, within the same scene, with all the same cast members, on the same set, we introduce telescopic cameras, forget about them, zoom in digitally on a distant object, and Saru develops magic eyes. So, why is the Shelby Method a thing, and why does it matter? Well, it’s a staple of writers like Damon Lindelof and Alex Kurtzman and Roberto Orci, who have throughout their careers relied on overloading the audience with new information so quickly that the audience can’t pierce their baffling, confusing, often nonsensical storylines. This lifts the burden of having to make sure their stories are in any way satisfying, cohesive or clever. This goes as far back as ‘Lost’, where new plot threads and mysteries were introduced every episode without ever being solved. And not just ‘Lost’ or ‘Star Trek’. For another defining example, go and take a look at ‘Prometheus’. Crafting a smart, sensible story is difficult. And it takes a long time. And it often means that you have to sacrifice that cool thing you really want to include because it just doesn’t make sense. A few years ago, a friend of mine was asking for advice on a medieval fantasy book they were writing. In it, their characters frequented a sailor’s tavern. My friend had lovingly described every detail of this tavern, from the trophy fish on the wall to the shanties that were sung to the all the nets and floats and fenders and other maritime trappings that added so much character to this wonderful setting. They were so in love with it, and justifiably so, that they had made it one of the main settings for their story – a comfortable port of call to which their characters frequently returned. The story all took place a hundred miles inland. On the edge of an ancient desert. My friend had asked me to help them figure out how to make this awesome maritime tavern fit within the narrative they had constructed. And I couldn’t. The best solution I could come up with was that it had been ironically decorated that way by its owners. Kind of a trendy hipster “out of place / fish out of water” bar. Which was hardly a satisfying explanation. My friend was having this quandary because they cared about the story they were telling. This was a passion project, and they wanted it to be as good as possible. This wasn’t some product they were churning out to hit a commercial target. They’d been labouring for years on the story that they wanted to tell. If the writers of modern day Star Trek want to ignore the franchise’s larger continuity, then that’s up to them. If it gets in the way of them telling the story that they want to tell, then I say, go for it. Violate that canon. Every other entry into the franchise has done before them. But here, in ‘Discovery’s second season, they can’t even be bothered to stick with their own continuity, even within the same scene. They make a cool thing happen. Then they need another cool thing to happen, but it contradicts the previous cool thing. Don’t worry – they just space the two cool things out with at least six lines of unrelated dialogue and they’re golden. And if you didn’t notice, then congratulations.